LOS ANGELES (AP) — Hamel Hartford Brookins, a bishop of the African Methodist Episcopal Church for 30 years and a longtime civil rights activist, has died in Los Angeles. He was 86. A church statement says Brookins died Tuesday at his home. The son of Mississippi sharecroppers, Brookins was minister of a country church in Arkansas and became acquainted with future President Bill Clinton. 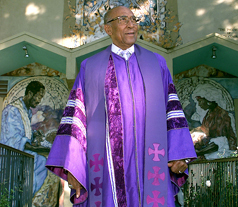 Before becoming bishop, he served 13 years as pastor of First AME Church of Los Angeles and led the congregation through the construction of a multimillion-dollar cathedral. Brookins helped found Jesse Jackson’s Operation PUSH and was involved in the campaigns of Tom Bradley, the first Black mayor of Los Angeles.